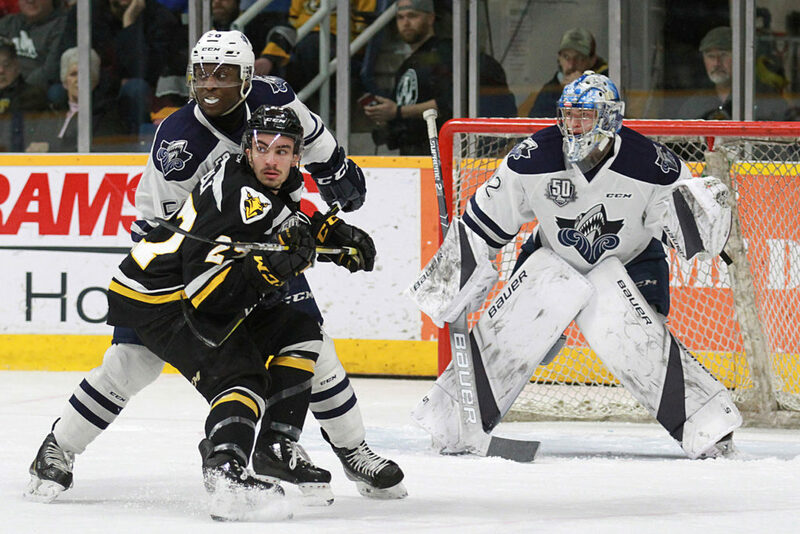 The Rimouski Océanic were able to weather first period pressure from the Screaming Eagles en route to a 5-2 victory in Sydney on Thursday night. Rimouski now leads the best of seven series 3-1 and the Eagles are facing elimination tomorrow night at Centre 200. Rimouski struck early to take the 1-0 lead. Carson MacKinnon elected to shoot on a 2 on 1, and was denied by Kevin Mandolese but the rebound came out to Olivier Garneau who buried the opening goal at 2:07. The rest of the first period belonged the home team, with the Eagles outshooting the Océanic 13-3. Derek Gentile had multiple big scoring chances towards the end of the frame but Colten Ellis stood tall and it remained a 1-0 score. There would be a breakthrough for the Eagles in the middle period, however it would not be enough to turn the game around. Just past the five minute mark a sequence of short passes led to Shawn Boudrias blasting a shot over Ellis for a power play marker to tie the contest. 13 seconds later, the Océanic had their lead back. Alexis Lafrenière was at the side of the goal, and sent the puck up to the top of the right circle to Garneau, and from the same spot he scored his first goal he potted a second and it was 2-1 Rimouski. The shot clock was almost the inverse of the first period in the second period with Rimouski outshooting Cape Breton 19-5, and it was a 2-1 game heading into the third period. There was no tying goal to be found in the third period and it remained a one goal contest for the first 13 minutes. Then two goals a minute apart would take the life out of the Screaming Eagles. D’Artagnan Joly was the trailer on the rush for Rimouski and was able to put a rebound by Mandolese to make it 3-1. At the 14:28 mark Jeffrey Durocher handcuffed the Eagles netminder for a puck that just slipped over the goal line and Rimouski had a three goal lead. The Eagles were given a bit of hope when MacKinnon was sent off in the final minutes, and coach Marc-André Dumont elected to lift his netminder for an extra attacker and 6 on 4 situation. The home side could get no closer though. After the power play had elapsed, Cédric Paré hit the open goal and Rimouski sealed the victory. In the game’s final minute, Kyle Havlena was able to put a point shot by Ellis to close the score to 5-2 but that would do it for the goal tallies on the night. Ellis stopped 22 of 24 shots in the win, while Mandolese turned aside 27 of 31 in the loss in addition to the empty netter.